On holidays, my wife cooks like an Italian grandmother. You could show up unannounced with a family of five and we’d have enough for everyone … with leftovers. So of course for Easter she cooked and colored 4½ dozen eggs. I needed a way to start using them up. 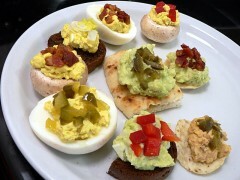 Enter … The Deviled Egg Bar.